An exclusive design to Luck & Luck - these card table numbers are the perfect addition to your wedding or party table and suitable to go in a holder. 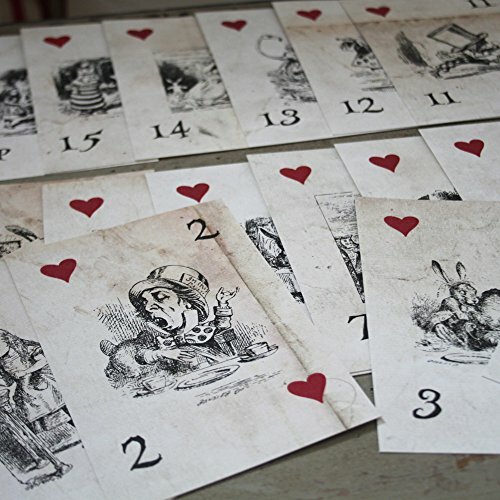 Each card is printed on both sides with a different Alice in Wonderland image on each. They are printed cards on 300gsm white laid card but with a distressed tea stained style finish to them to give them an aged look. Each card measures 15cm high and 10.5cm wide. There are 16 cards in each pack, one says Top Table (if required) and then numbers 1-15. If you have any questions about this product by Luck, contact us by completing and submitting the form below. If you are looking for a specif part number, please include it with your message.